Yay, we can finally spill the beans on our brand new brow product! It has taken some serious willpower keeping this baby a secret for the past few weeks. Like seriously, now we know how Kylie Jenner felt keeping her pregnancy under wraps. We'd been tossing up as to what product our Fit-fam needed next, and the most obvious choice was a brow product. Sweat-proof brows...where have you been all of our life? Our Shape It Till You Make It Brow Cushion is everything you'd expect it to be...and so much more. Now we're sure you've got a few questions and so we've done our best to answer the most obvious ones. If you're anything like us you're certainly no stranger to a brow product. You've likely tried powders, gels, pencils, maybe even stamps (seriously who invented that?) to varying degrees of success. Well, our Shape It Till You Make It Brow Cushion is a little different. What you get is a dual-coloured 'cushion' soaked in liquid brow product all encased inside of a handy compact. What sets this apart from regular gel or liquid products is the innovative cushion packaging that allows you to pick up the perfect amount of product on your brush and apply effortlessly for a natural, flawless finish. We have two options 'Blonde' and 'Brunette' each with two unique shades within the compact. If you've got blonde to mousey brown hair, 'Blonde' will be the pick for you. 'Brunette' is for those with brown to black hair. Using both shades allows you to create a colour gradient closely resembling that of naturally full brows, hence the name, 'Shape It Till You Make It'. Are the Brush and Spoolie Included? Yes! No need to deep dive into your makeup bag every morning. Sweatproof, smudge-proof and long-wearing? Tick, tick, tick! These brows aren’t going nowhere. When you apply your brows in the morning, you want them to stay perfectly full and flawless until the moment you're washing your face to remove them. Trust us, we've got your back brows on this one! Over the past few weeks, we've been putting Shape It Till You Make It Brow Cushion to the test at work, at the gym, even went to a hot yoga class! Trust us, until you take it off with make-up remover/micellar water THEY WILL NOT SMUDGE! Once unsealed, it usually lasts 3 to 4 months. Be sure to always snap the compact closed after each use. You don't want the magic brow juice drying up! All of our ingredients are vegan and free of sulphates, parabens, talc and any nasties. You can find a detailed list of them on our product page here. If I can do it after I've snoozed my alarm three times, spent far too long making smashed avo for breakfast, leaving myself 5 minutes to get ready...it will be a walk in the park for you. Just dab the brush in the cushion and apply feathery strokes until you achieve your desired fullness. Trust us, it's easy. Still have a question? Hit us up on Instagram, Facebook or Email and our team will get back to you as soon as possible. What are you still doing here? 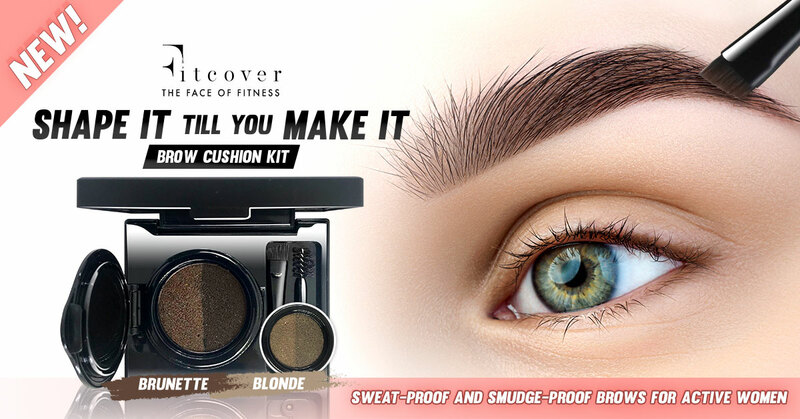 Our Shape It Till You Make It Brow Cushion will almost certainly sell-out. Quick, quick, quick! Click here to order yours today!